I do a lot of cooking so I have gadgets for just about anything to do with the kitchen, but I have a new one to add to the list. 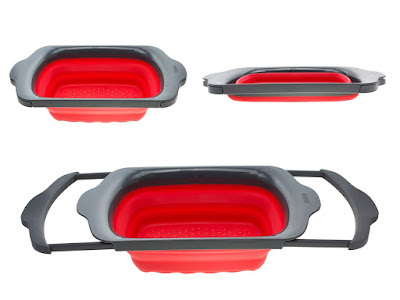 Collapsible Kitchen Colander is so handy! It will fit just about any sink due to the pull out adjustable handles. It feels so much cleaner and more sanitary than my old colander that sat in the bottom of my sink. I like the hands free operation of this colander, it really reduces the chance of being burned or scalded draining hot foods. It's great for washing fruits and veggies too. The non-slip handles keep it in place and are gentle to all surfaces. The strainer tub is collapsible. It pops open with just a little push and after you've used it and rinsed and dried it just takes a little push and it collapses it back to nearly flat so it doesn't take up much storage space. It's dishwasher safe and made of non-toxic materials, BPA free and USDA approved for consumer safety, and is heat resistant up to 600*F.
This collapsible colander has replaced my old ones. I'm really impressed.